Jan has over 25 years of business experience and has held executive roles in business development, marketing, sales, training, product management, and as a CEO. Prior to his business career, Jan joined the U.S. Army at age 17 (weighing 114 pounds) where he spent six years in Special Forces as a medic and “A” team executive officer, and three years as a military intelligence officer. As a professional speaker, Jan was recognized as one of “The Top 100 Leadership Speakers for 2018” on Inc. Magazine’s Inc.com site. 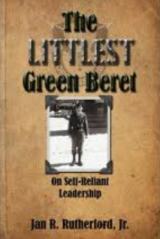 Jan presents the self-reliant leadership principles contained in his book The Littlest Green Beret: On Self-Reliant Leadership to business leaders across the U.S. and Europe. Half the proceeds of Jan’s book are distributed to the Green Beret and Special Operations Warrior Foundations. Jan also serves on numerous boards, and invests time with select Department of Defense units and veteran organizations. Jan is the founder of Self-Reliant Leadership, and cohost of The Leadership Podcast. He holds an MBA from the University of Phoenix, where his research focused on the effects of long-distance learning on job performance. He earned his undergraduate degree in Political Science from the University of South Florida, and was a Distinguished Military Graduate. Jan is a dual U.S. and Irish citizen with a special affinity for Ireland and the wilderness of the Western United States.